Naz holds a Fine Arts degree from Byam Shaw School, with post-graduate studies in Lithography from Slade in London. Her work is part of many collections both nationally and internationally, and has also been exhibited worldwide. 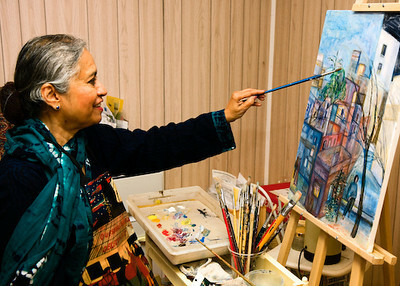 Naz teaches painting and printmaking at the Ottawa School of Art. Neera Huckvale (exhibition in Salon B) is a former student!